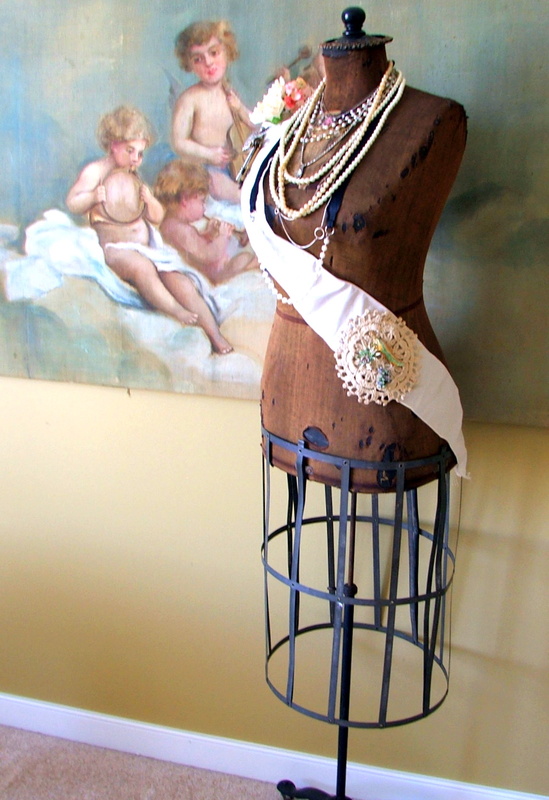 Carol at The Polka Dot Cottage is hosting a Dress Form Ball starting today. Penelope Rose doesn’t get out much but she is really excited about attending. caged skirt to the music. playing in my jewelry box. The corsage is made from vintage paper roses. “ladies” dressed for the ball. Is she "vintage"..I know we don't like to share our "age"! I hope she can meet Bella Blue and Gwen! She is a real beauty Sherry. Love her jewelry and that awesome skirt. Sherry, I love your dress form and you dressed her quite nicely. I don't have one so I can't play. Penelope Rose is stunning. Her sash and jewelry is just amazing. She's just so glamorous! Lovely! And what a great idea! 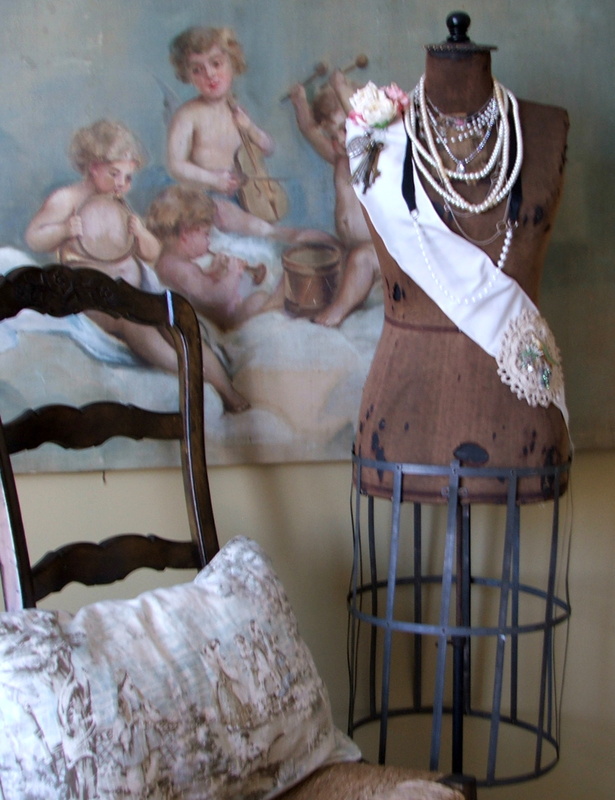 Penelope is fabulous – I just love a dress form with an iron skirt! Lovin' the metal skirt on your gal!!! Popping in from Carol's dress form party to say hi! What a cute idea! I need to dress up Coco and go out on the town! Well hello Penelope Rose! love your outfit. thank you for showing us, and enjoy your party! What a lovely idea! Fab! Penelope Rose is just gorgeous! I'm sure she'll have a wonderful time at the ball! I do hope Penelope Rose will make friends with my Adelaide…. 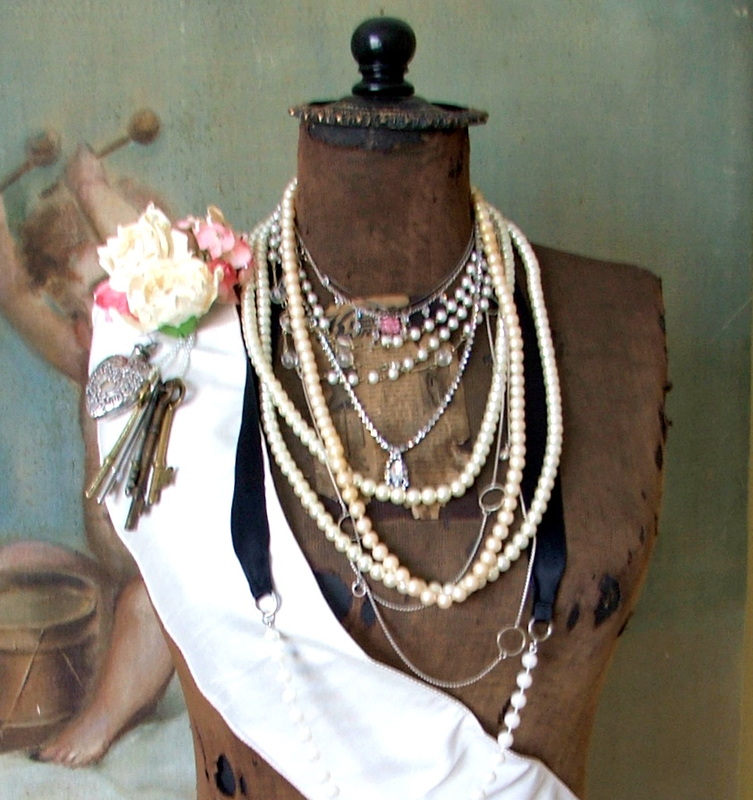 Love her jewelry and sash! What a fun idea, having a dress form ball. Penelope Rose looks lovely! This girl literally makes me SWOON. She is so absolutely gorgeous. What a treasure. I just LOVE your dress form…she's so perfect with her tattered top and metal cage on the bottom! Wow, just gorgeous!! 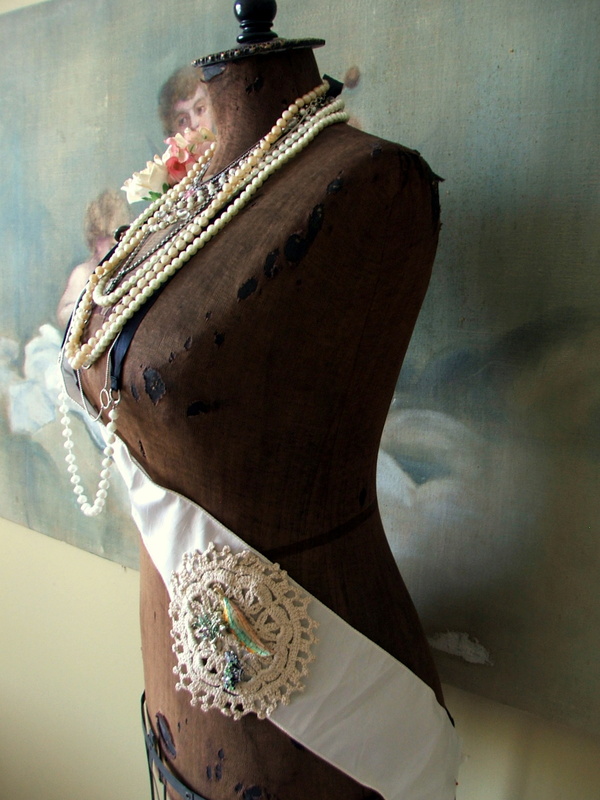 This is such a great vintage dress form! Love the way you have adorned her so not to hide her natural beauty! 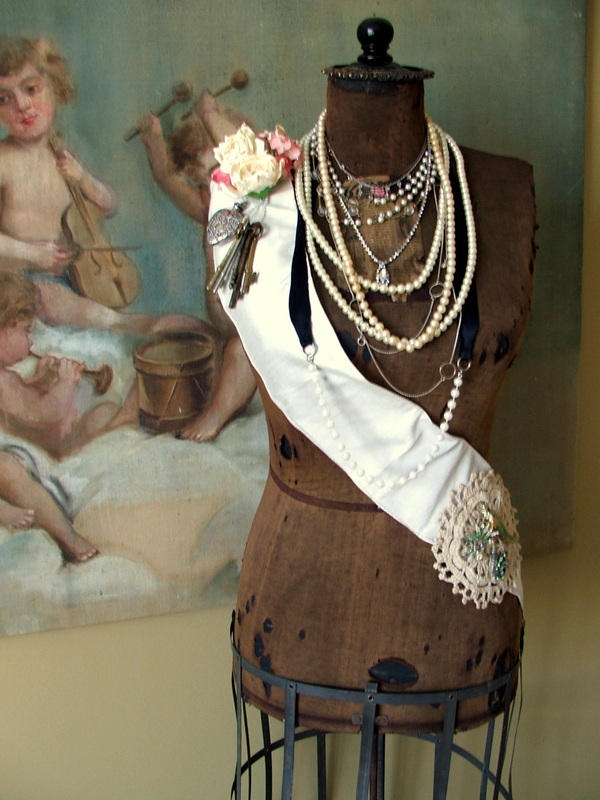 Love Penelope Rose…She certainly does look like she will be the life of the party..love your jewels! How cute! I wish I had a dress form. I don't know where I'd put it, but I really find myself drawn to them. Yours looks very nice for her party. Penelope Rose looks ready to Party! *Winks* Thanks for the link so that Mannequin Yvette can attend also… she recently Modeled a little something-something I bought for myself for Valentine's Day. Penelope is looking stylish. Is that the winning pageant sash she's sporting? She is gorgeous! Thanks so much for sharing with us at WIW. Can't wait to see what you share next week! Penelope Rose is such a beauty! Thank you for sharing at Potpourri Friday! Oh, Penelope Rose is gorgeous! She will be one of the prettiest at the ball. Penelope looks beautiful! Nicely put together. I love her fabric body. She looks great!